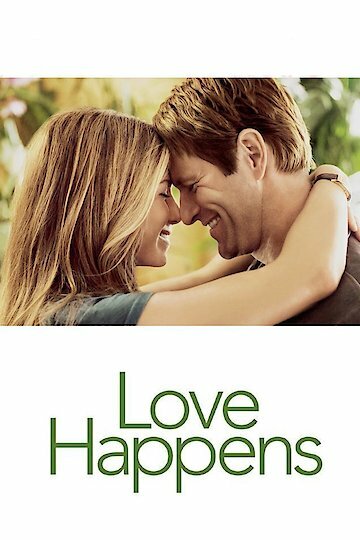 "Sometimes when you least expect it..."
Love Happens is a movie that was created in 2009 as a romantic drama. The film was directed by Brandon Camp, produced by Scott Stuber and Mike Thompson, written by Brandon Camp and Mike Thompson, and features music and cinematography by Christopher Young and Eric Alan Edwards. The famous faces in this film are Aaron Eckhart, Jennifer Aniston, Frances Conroy, Dan Fogler, Martin Sheen, and Judy Gear. The three main characters of this film are played by Jennifer Aniston (Eloise), Aaron Eckhart (Burke Ryan), and Francis Conroy (Eloise's Mother). Burke Ryan makes his living by being an author of a self-help book and with his Ph.D. He and his book both give people advice on how to deal with loss and with the death of loved ones. The influence of the book he writes in the movie came after he lost his wife in a car accident, thus spurring his drive to create a book to help others cope with what he did. While he is giving a workshop he runs into Eloise who is attending the workshop. The movie explains after this that Burke has not really been following the advice that he offers in his book on how to deal with grief and has been deeply grieving the loss of his wife. This is the moment when he gives the confession in the movie that explains why he still grieves over this moment in his life despite his current profession. Because of this action he is given a great deal of aid by the mother of Eloise and his father's wife who is played by Martin Sheen. The two of them along with others help Burke realize that he can get past the overwhelming grief of his loss and move on with his life. He and Eloise become very close romantically after his confession and she inquires as to when they are going to be able to get to know one another better. Love Happens is currently available to watch and stream, download, buy on demand at Amazon Prime, HBO NOW, Amazon, Vudu, Google Play, FandangoNow, iTunes, YouTube VOD online.